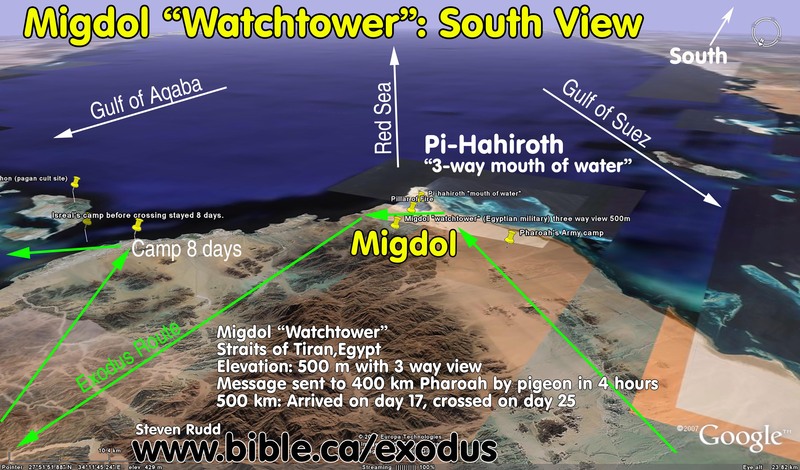 The Exodus Route: Migdol "Watchtower"
The word "Migdol" in Hebrew means "watchtower". It refers to one of many Egyptian military lookout posts scattered across Egypt. The existence of the Egyptian migdol's is confirmed by archeology. Remember, there were many Migdol's and it is likely that the one's mentioned in Jeremiah and Ezekiel are not the same one as mentioned in the Exodus. On the other hand, given the importance of the Exodus Migdol, being at a three way intersection of ocean, all the references below may refer to the same Migdol. 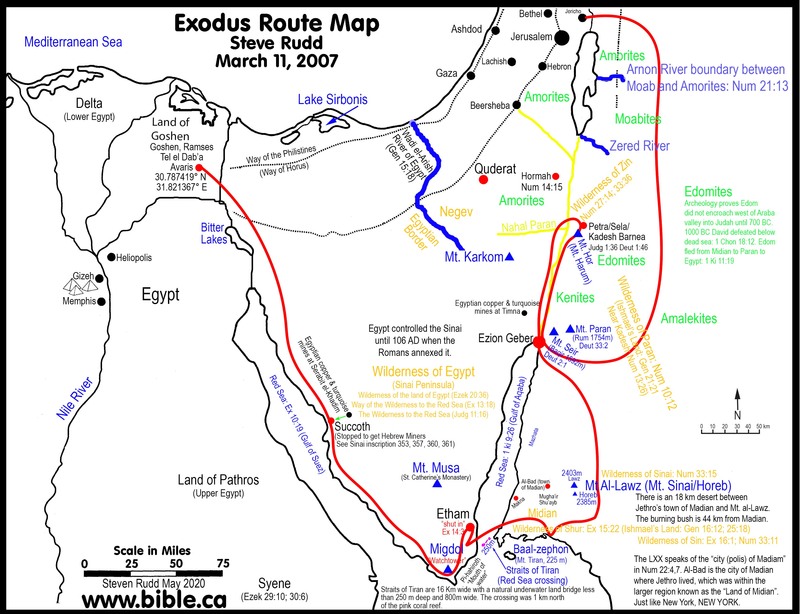 Ezek 29:10; 30:6: therefore, behold, I am against you and against your rivers, and I will make the land of Egypt an utter waste and desolation, from Migdol to Syene and even to the border of Ethiopia. Ezekiel 30:6: 'Thus says the Lord, "Indeed, those who support Egypt will fall And the pride of her power will come down; From Migdol to Syene They will fall within her by the sword," Declares the Lord God. The elevation of the Migdol is 500 meters. The Migdol located at the three way intersection of the Red Sea, gulf of Suez and gulf of Aqaba was one of the most important. From the vantage point on the ridge of mountains near the sea, you could get a view for 30 miles each way. It was of huge military and defensive importance. Homing pigeons had been used for communications in Egypt since 2500 BC, a full 1000 years before the exodus. Large numbers of pigeons were taken to each Migdol and kept captive, until they were needed to fly back "home" to Pharaoh in Egypt. Homing pigeons fly at a cruising speed of 100 km per hour. It would take less than 5 hours for a pigeon to send a message back to Pharaoh. 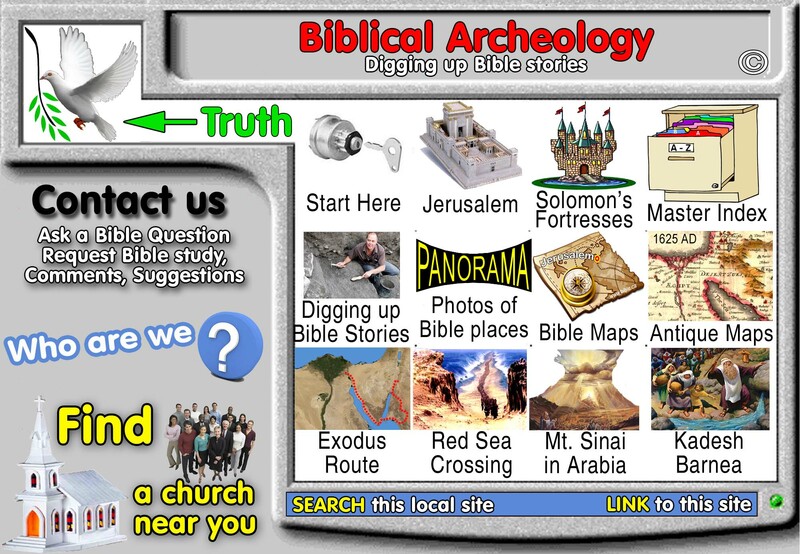 So God was deliberately baiting Pharaoh who knew the terrain. Etham was the end of the 200 mile long coastal plain. 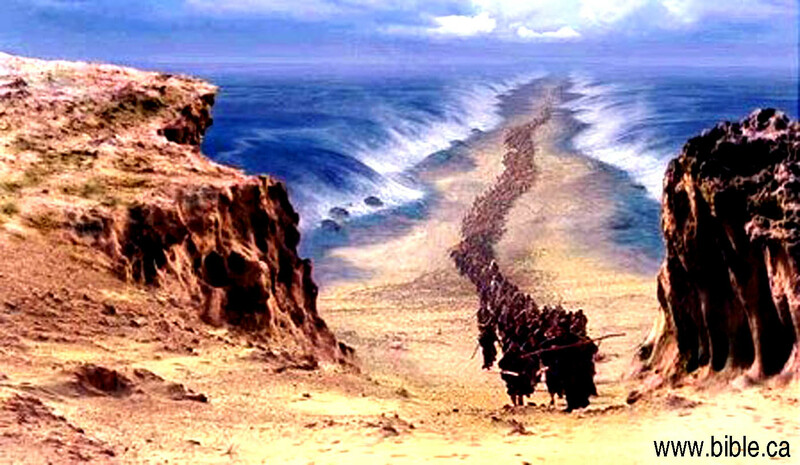 When Israel started back towards Egypt, Pharaoh chased towards them with his 600 chariots. 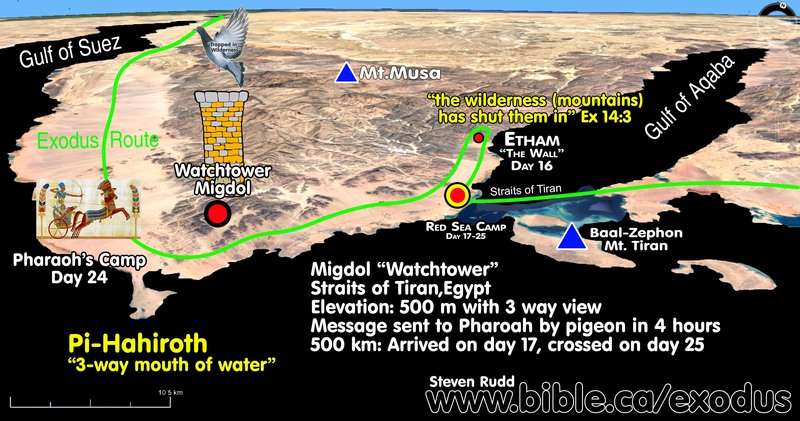 Pharaoh's Migdol (one of many military watchtowers located on top of mountains) sent a homing pigeon to Egypt. The first known use of passenger pigeons in Egypt was 2400 BC. They fly at 60 miles per hour for up to 600 miles. It is 250 miles back to Egypt from the Migdol and a pigeon would have got there in 5 hours travelling at a casual 50 miles per hour. The army need only travel 35 miles per day on return. total time: 8 days. The sandy coastline would make travel easy and fast. Message from Pharaoh's military "Migdol" to Egypt by homing pigeon at 80 km/hour: "They are moving aimlessly and the wilderness at Etham has shut them in." Pharaoh's army pursued Israel with horses and 600 chariots from Egypt to where the pillar of fire stopped them. Up to this time, Egypt was a dominant world power. They ruled from Migdol to Syene, down to the border of Ethiopia. 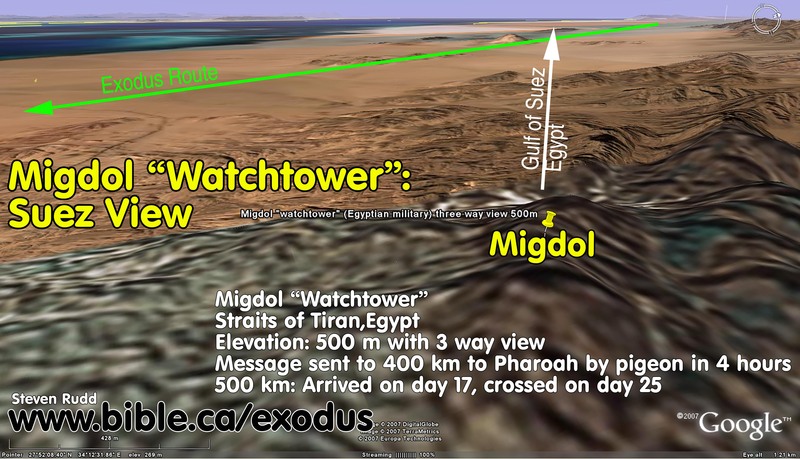 If Migdol is the southern most military watchtower beside the Red Sea crossing point at the Straits of Tiran, then this verse makes a full sweep of Egyptian territory on both sides of the Suez Canal. 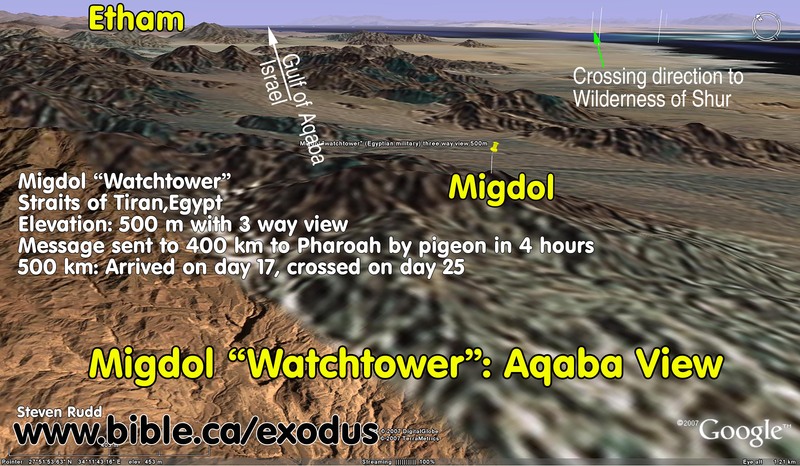 In the traditional exodus route, Migdol would be placed on the Egyptian side of the crossing. It is important to remember that they went past the Migdol to Etham, then back tracked to camp at the Red Sea. For the Bitter lakes, such is impossible. For the Port of Suez crossing, there is a nice mountain range that would work well for a Migdol watch post. In fact we believe it is likely one existed there, but the other serious problems with the Port of Suez disqualify it as a candidate for the Red Sea crossing. 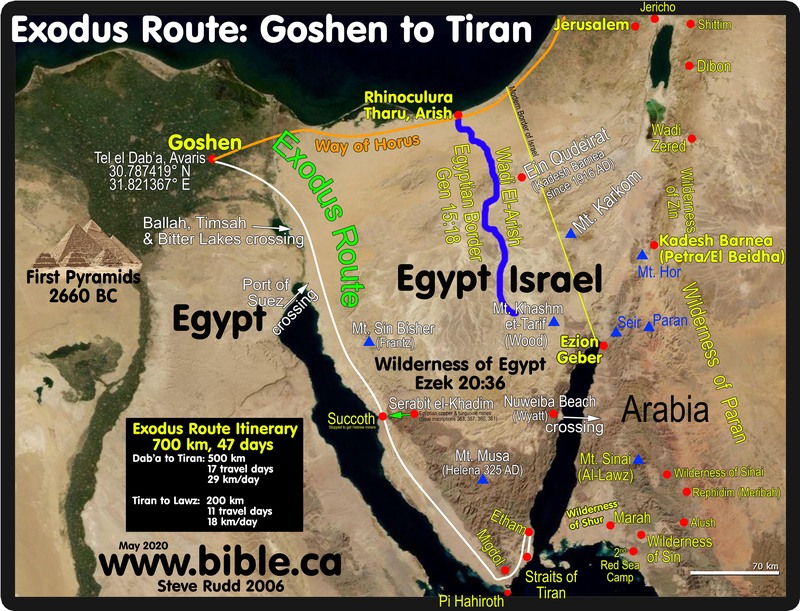 For example there is no logical place for Etham past the crossing point, since it opens up into a huge flat plain.